The Big Battery Hunt is returning to Corrie. We’re really focusing on helping the environment at Corrie Primary and want to help in any way we can. We have joined the national schools partnership initiative to collect used batteries and send them off for recycling. There is also the opportunity to win lots of great prizes. Only when you fill me up, do I get really glad. Don’t throw it on the floor. Then go and get me some more! Tree planting last half term was a huge success! 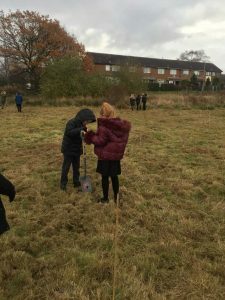 Every class in the school came out in force with their teachers to plant more trees around our school. The trees are making great progress and are battling hard against the very cold weather we’ve been having. Next the Eco team plan to grow some wild flowers in our school grounds too. On Monday 4th February the Eco team met to discuss matters to be tackled during this term. We discussed the planning of waste week that will take place in March of Spring two. The children felt that it would be good to begin to take an audit of the energy levels used around our school and decide on ways in which we can begin to cut excess energy usage. We have also decided that the Eco team will make posters in order to advertise and raise awareness of this event. Next on our agenda was our planters. We discussed which vegetables we would like to try and grow in them over the coming months. The children decided that instead of just selling the vegetables to parents, we should try to include some of them in the salad bar during lunch times. NJ suggested that we create an activity during health week that enables children to become more involved in the growth of fruit and vegetables at Corrie. 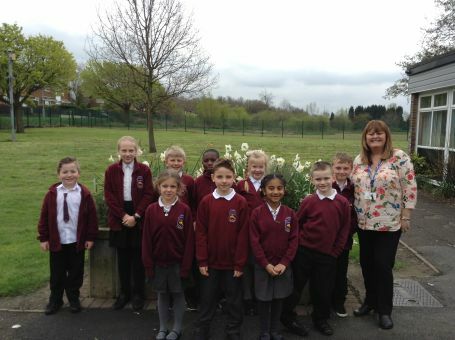 Thirdly we discussed the amount of litter that seems to be around our school grounds at the moment. The children all agreed that there are far too many children and adults throwing litter on the ground, particularly in a morning. We discussed the possibility of arranging more bins around the school grounds and posters to try and encourage people not to litter. 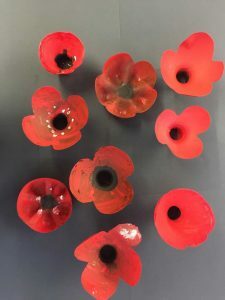 In Golden Time last week some children used plastic bottles to make poppies. We chose to do this because we wanted to create some art to commemorate those who gave their lives in WWI. We’ve grown our very own pumpkins at Corrie, just in time for Halloween! 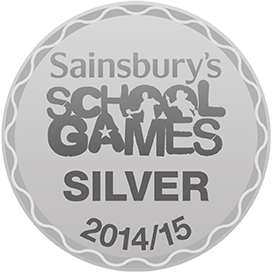 We would like to hold a competition to raise more money for our gardening fund. 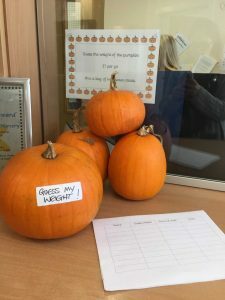 Come into the office and guess the weight of the largest pumpkin. The closest guess will win a Halloween trick or treat bag of goodies. We’re trying to work even harder at Corrie to reduce our environmental footprint. We have recently received composting bins. 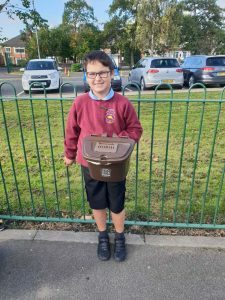 Tristan, our eco representative from 4D, has been taking it out at break time. We are going to compost any waste and use it to help us grow even more fruit & vegetables. Year 5 letters to the Government. 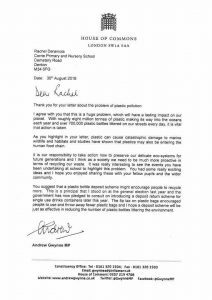 Last year, Year 5 wrote letters to Michael Gove to persuade him to alter current approaches to reducing plastic waste and to encourage the Government to do something about it. This is an example of the reply’s we got back from the House of Commons. Campaigning Corrie’s ‘Lose the Waste’ event. Children and staff wanted to demonstrate their concerns about the amount of plastic waste and the consequent pollutant effects both in the local area and globally. Please have a look at our journey so far in promoting our concerns to the local community. 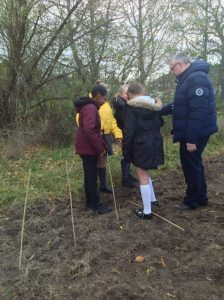 The Eco team meet each Half Term to discuss jobs which need doing around the school such as planting seasonal plants, tidying gardens around school and litter collection around school. The Eco Team is made up of Eco Warriors (one from each Class) who are nominated by their classmates and have the responsibility of ensuring the School’s Eco Policy is being implemented. This is through jobs such as turning lights off when the classroom is empty, encouraging paper recycling within the classroom, reporting any leaking taps etc. 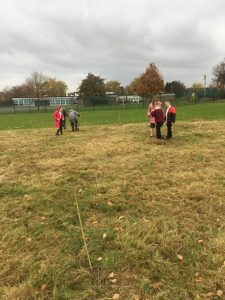 Jobs which the Eco Team have been currently undertaking include: emptying the large vegetable planters and litter picking to ensure that school grounds remain neat and tidy. Please save all Morrisons Lets Grow vouchers as we buy many of the gardening resources and plants for Spring using these, thanks! In the summer term we are hoping to run a Gardening club for the key stage 1 children that will be supervised by the student Teachers.